First things first: Merry Christmas everyone! Whether if you're enjoying holidays with your family and closest ones, or you're away home for any reason, I hope you're having a terrific time, resting if needed or partying really hard. As for me, I will be sticking to the first option as the last two weeks have been pure chaos of lack of sleep and rush everywhere. Seriously: sleeping less than 4 hours a day would have sounded almost exciting when I was a child, but now as a grown up it's the worst thing ever. Especially if you spend those 20 hours of no-sleep finishing floor plans, photoshopping images like there's no tomorrow and arguing with your teammates (or sometimes, with yourself) if you should explain something this or that way. Seriously, my fingertips hurt of being drawing last hour schemes and diagrams, and I can't even count how many painkillers I've had for my headaches on the last month or so. But it's finally holidays, work is over -for now- and here I am once again to share with you the latest outfit we just shoot a few hours ago. I don't know about you, but Christmas and Christmas' Eve are not very big days on my family. I have very few closest relatives (just my parents, grandparents and uncles), and being an only-child and not having around any younger kids makes this holidays not being a very big deal. Instead, we just arrange some last hour dinner or lunch at home, we give each other some small gifts and enjoy family company until going back home. My favorite part is usually when my grandpa is amazed at the sushi and japanese food I've been taking with me last 2 or 3 years, and he always asks me for one or two pieces to taste. We spent this Christmas' Eve at my grandparents' too, and as it was cold as ice out there I just felt in the mood of being wrapped on the coziest wool scarf (now I'm glad I invested on that vintage wide, huge Burberry scarf) and put on a pair of really comfortable shoes I could walk on after the insanely fun, post-exams party I was involved at three days ago. Those leopard soles are from Toutöu Shoes and since they arrived I haven't let go of them. They are craftsmen shipped in Elda, a town near Alicante (Spain) known for being cradle of footwear designers and manufacturers. I have very special feet (on the baddest ways of all) so, it's a huge thing I find shoes that fit me well. And I couldn't be happier with these! Also, the customer support was brilliant, as I thought for a moment we lost track of the package during its journey. 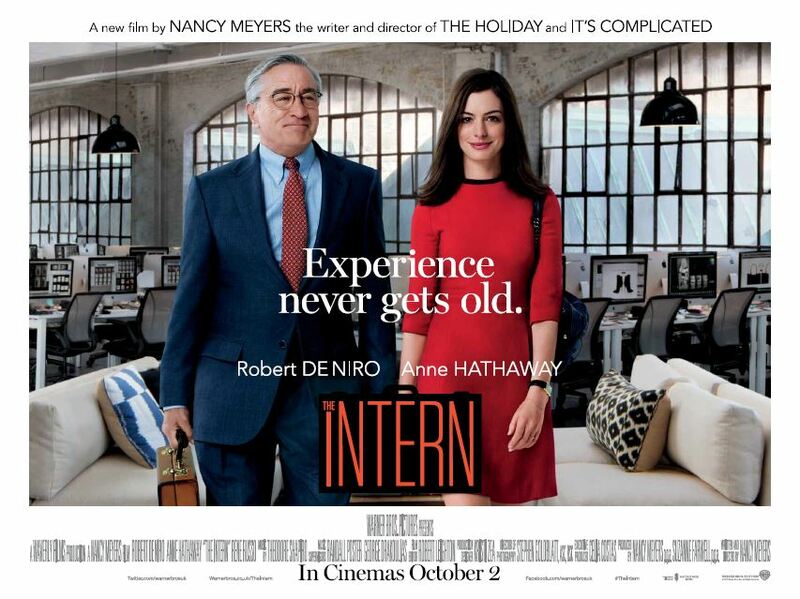 Our plan for today is have lunch together and maybe go to the cinema in the evening. What's your plan for the following holiday week? It feels absolutely unreal to have one year route behind! I can't believe about a year ago I was asked to take part into this crazy, massive, eager project which is Chapelle Magazine. A new, unique fashion magazine concept born in Valencia thanks to a crew of hardworking, dreamy young designers, both professional and amateur fashion photographers, models, bloggers and writers who wanted to spread the word about trends and style away from fast-fashion and world-known regular magazines. 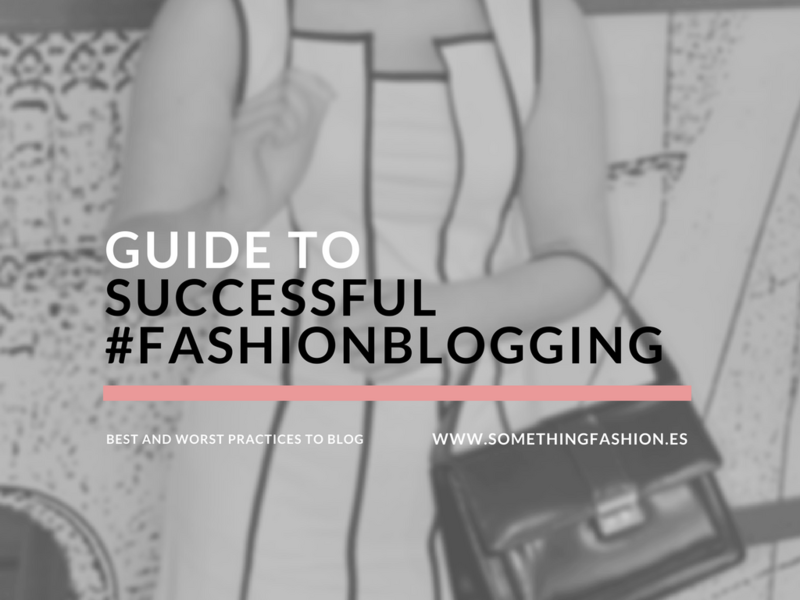 Since then, I've been not only writing fashion-centric articles, but also helping and lending my hand in whatever I could do, from managing the website to help in the coordination of some of the events which have been held in the city. Although being stucked on a total crazy, almost last week full of work and tons of things to do where I've been sleeping less than 5 hours per day and taking painkillers as breakfast (the massive headaches and bone aches are nothing I ever asked for), I was required to help behind the scenes of the #1yearcelebration of Chapelle Magazine, which was exhausting but very regarding. Focused on coming fashion trends for this 2015 Christmas season, we could enjoy a catwalk filled with party and formal outfits, a perfect fit for coming events and celebrations. Lots of white and golden hues, baroque vibes and different textures thanks to E. Jairycovich, Brotocó Atelier, Auba Roig, Ada Cerdá, Javier y Javier, Gustavo Lemos, Cubero-Quesada and Jaime Piquer. Once again, a night to remember thanks to Astoria Palace Hotel and this incredible crew! Last Wednesday, eight o'clock evening at DeWall space in Valencia. Once again, it feels truly delightful to live on a city where there's a lot happening when it comes to fashion. Valencia is 100% conscious about its potential when it comes to design and creation, and how to show that off. Every time I got an invitation to an amateur fashion catwalk, or presentation party downtown there's no hesitation I will attend to it. There's so much to know from young designers and entrepreneurs who not only have put all their knowledge and effort into their projects, but also they're already testing new ways to share, to create and to rethink everything around. And that's thrilling. So, last Wednesday evening my dear friend Elena and I left on hiatus mode every piece of our class-projects, and headed to DeWall and its terrace to enjoy an informal cocktail filled with sweets, beer, art, live music, friends and fashion. 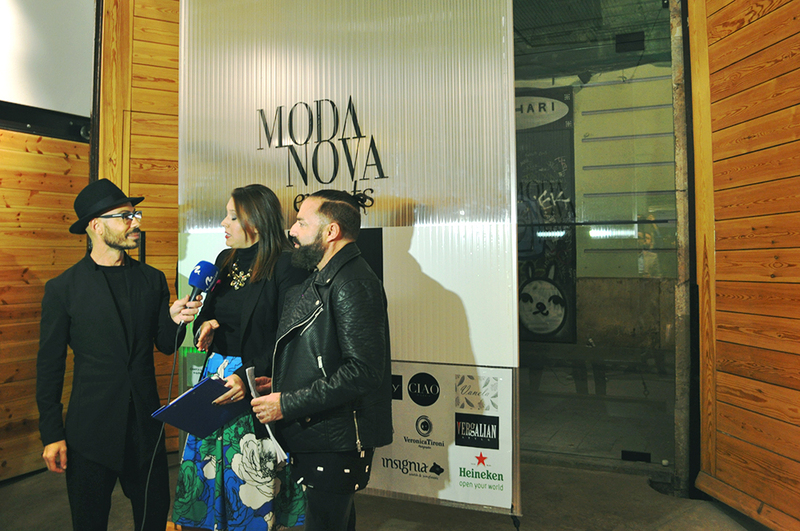 Lots of fashion thanks to Moda Nova Events, the newest fashion-focused event management agency in town. 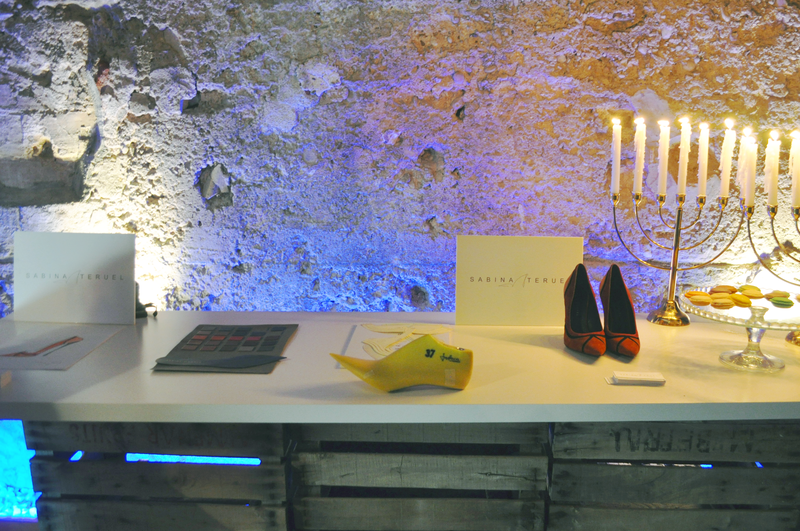 We had the chance to meet and greet designers who are just starting their business journey into the crowded (but exciting) world of fashion design in the most friendly and warm ambience of the terrace. 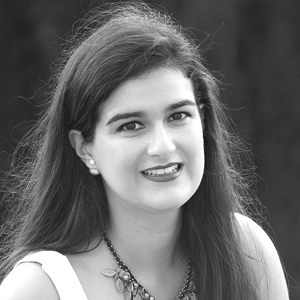 Not only clothing design, but also shoemaking (Sabina Teruel is the face behind those dreamy heels you're seeing below. It was so nice to meet her and see her new collection! ), headpieces and accessories by Vanela and a catwalk featuring emerging designers and fashion students as Abel Esga, Miss fü by Andrea Chafer, Vergalián STYLE and Malo Moya. I'm so glad I could just stop for a couple hours working that evening and headed by to have a drink and enjoy not only design, but also a nice and inspiring atmosphere. A true lesson on how to make a city like Valencia committed and conscious of the talent around it, and a perfect plan for an evening near exams! I used to draw a lot when I was a child. Really, drawing was (and still it is) one of my passions which helped me express myself and tell stories I was never able to speak out with words. Fashion mannequins were pretty common on my sketchbooks but their stylized figures and lines mutated eventually into buildings and façades, and so it has been until today. That's why I always feel so fascinated meeting new designers who like to draw their own sketches, professional artists who are not afraid of failing on a pair of lines, because the final piece would look good anyway. And they know it. David Yza was born in Mexico and studied at La Salle University. 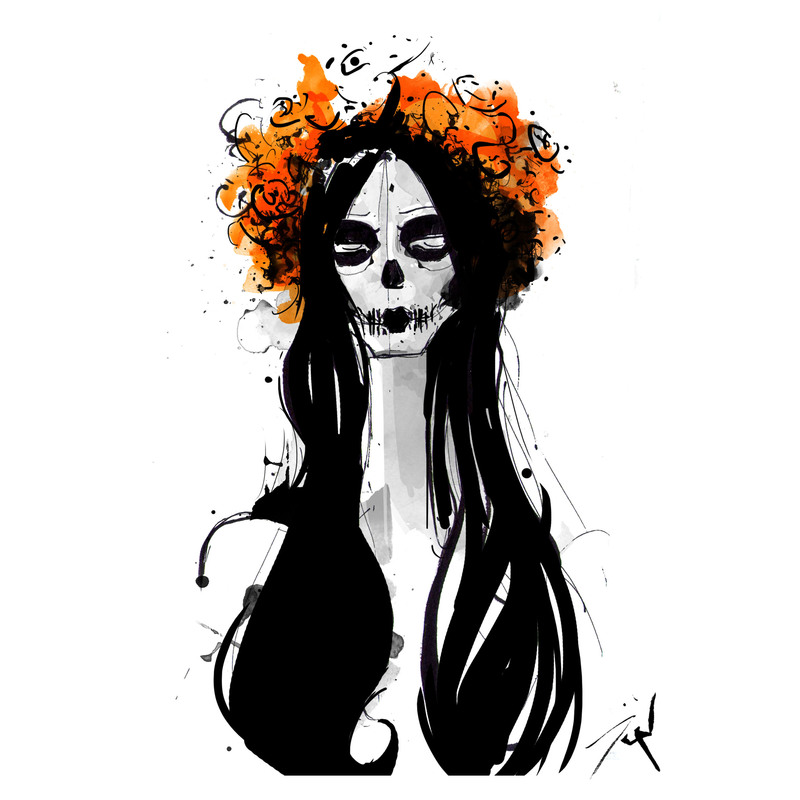 He works as a graphic designer and fashion illustrator. I discovered his illustrations thanks to my friend E. Jairycovich and Chapelle Magazine where I write and contribute from time to time, as he's been featured on the issue as artist too. "Apart from being a fan of cartoons, I had (still have) a great inclination and admiration for the world of style and beauty (...) On my sketches there was a certain focus into clothing, stylized figures and daring positions, as they were taken from an editorial" he says, stating that his drawing style originated as he realized he couldn't be 100% true to the images he wanted to emulate. David has been a self-taught artist, but he says that thanks to his graphic design studies he's been able to have a better approachment to illustration and different techniques which have enriched his work and made it complexer and funnier as well. His work is unique, as he plays both with traditional and digital media to create his elegant shaped drawings mostly sketched with chinese ink, watercolor and then post-produced on the computer. He took inspiration from old drawings of Yves Saint Laurent or clean lines and slight touches of color master Rene Gruau, although David's style is more into quick traces and incomplete figures, which make his work dynamic and able to be interpreted from different sides. Like if everyone could complete the sketch on their own minds making thousand of different versions of it. 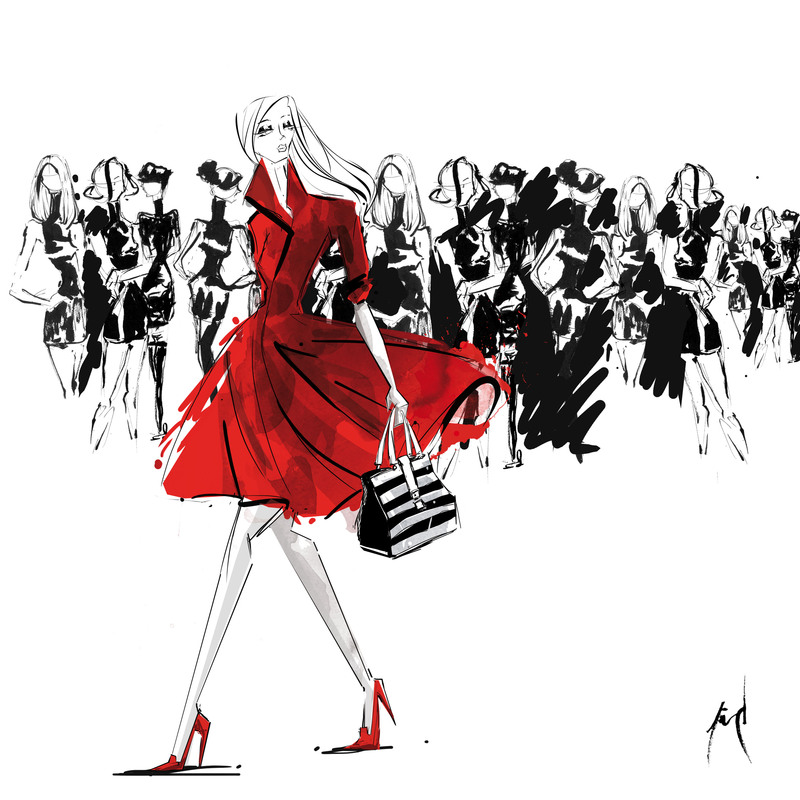 His art took the essence and simplicity of classic fashion illustrations but adapting them into a 21th Century outfits which he has achieved through a long process based on practice and hard work. I want to thank David for being so friendly and enthusiastic on taking part on this feature at Something Fashion, and hoping to see his designs soon at the biggest publications! Good luck! My looks don't define 100% of myself, and as much they're helpful sometimes, what I wear may also hurt me too. I used to be a very shy child, spent all my teen years afraid of what was being said of me, what people thought about how I looked and scared of being myself, to talk too much, to say something wrong. The other day I was talking about this with a really close friend I met in College two years ago now, and I can tell you I was totally dying of laughter when she remembered me what she thought about my looks and behaviour the first time we met. Basically I was the conceited, mean, know-it-all, first row sitting girl who had a fashion blog and was class president. Then we started working together, we became very good friends and have already walked a long friendship way together (and hoping to keep walking!). Cool, isn't it? This should lead us to discuss the always around "do not judge someone on the first impression" cliche, but I won't be talking about that today because I want to go a little bit further. Making a first good impression matters. A lot. I was a really quiet girl who was really afraid of expressing what I thought or felt, and once I started changing the way I dressed, once I started doing fencing and sport, perfecting a makeup routine every morning, then I became more confident about myself. I've now realized that those physical changes helped me love ME and no-one else. That is the key about all this. Looks matter, not as much to others as you would think, but they matter if they make you confident enough to go out and do your best. For me, it's not only about how much effort I put on doing something, but a pair of beautiful shoes on my feet may help me step stronger if I need a boost of motivation that day. Or a bright red lipstick may help me smile a little bit more if I got out on the wrong side of bed. I encourage everyone, any age, any gender to always put on a piece that causes this effect on them. Because it finally isn't about what you wear, but how you feel wearing it. 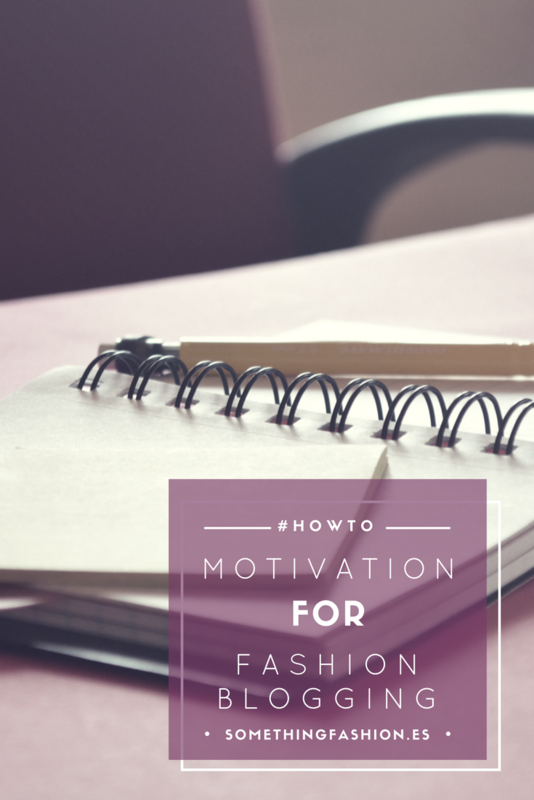 This whole post about self-confidence and motivation was all because this pink pencil skirt, kitten heels and statement Fedora hat outfit was my boost of motivation and touch of color on that day. Some days ago, when I had to show a project I put lots of hours working at and just felt like I had to look as nice and neat as my project board ended. There's nothing too special about this outfit, but just the way those heels sounded on every step I took as I carried my almost 1m x 0.5 m panel to hang it on the wall of the classroom before presentations, just made me feel amazing. 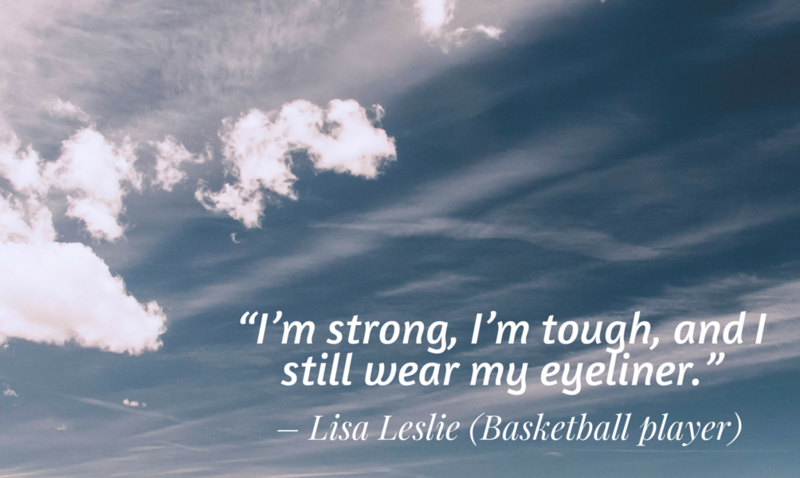 Is there any outfit, accessory or piece of clothing which makes you feel like this too? 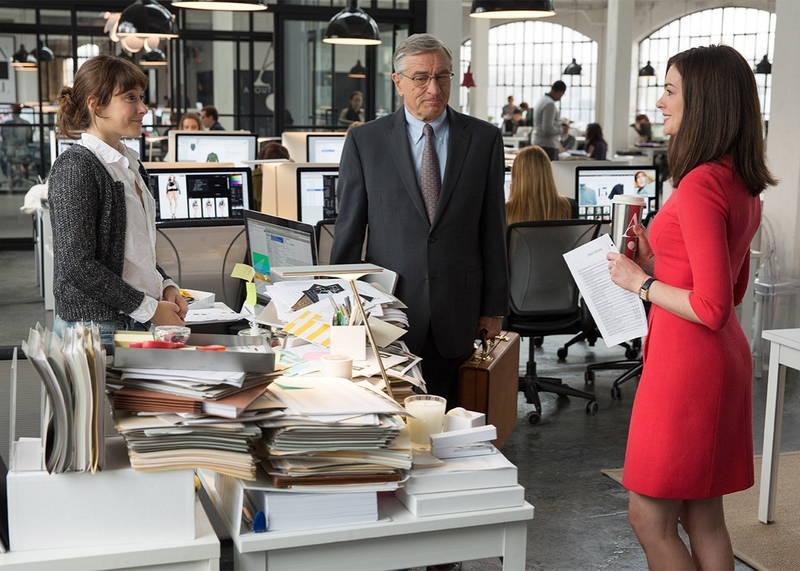 Haven't you ever felt amazing once you know you've been successful on doing your job? If you've been reading Something Fashion for some time, or you know a little bit about me, you might already know that I'm a sport enthusiast, and a former (but with comeback-soon aspirations) fencer. Now that I'm 100% concentrated on this year's issues and work, you can't even know how much I miss fencing and training with my friends every evening. No matter how tired I might be, or if I had a bad day: sport is what makes me feel better, is what keeps me active and motivated in the mornings if a hard week full of work is coming. Now that I quitted fencing and as the year goes by I realize how much I need doing something that is not related to classes or work, but more about me and my mind. In fact, a few days ago I came back home almost at 8 o'clock in the evening from a super horrible, exhausting exam, and the only thing I could think about was leaving home again to do some jogging and working out around Valencia. Working out is not only good for keeping fit and in shape, but also helps me boost my self-motivation and see how far I can go. Even if I fail, it's OK, because I tried to and went further than yesterday. So today I'm pairing with SportZone to give you some really cool ideas to start working out or just keep doing it if you are already into sport. As a woman who has been around lots of sports during all her life (I started swimming when I was barely a baby, then went into tennis, then moved to modern dancing until I finally lost myself with fencing) I think the most valuable tip I can provide you is invest on your sporty clothes, and specially invest on your training shoes. You can't even imagine how important for your health but also for the best performance on what you are doing your shoes are. 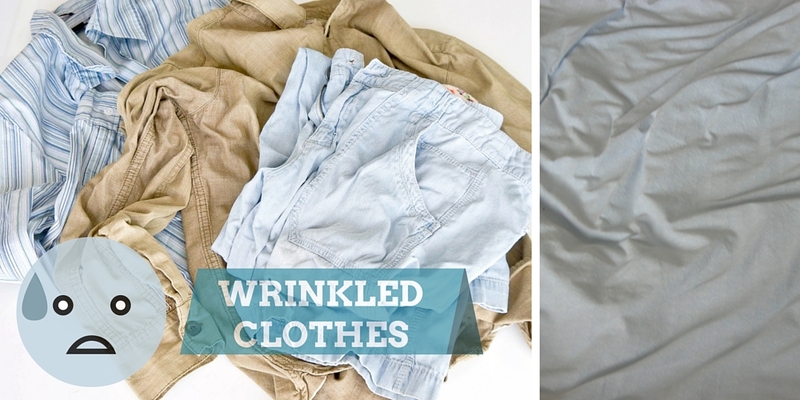 So are the rest of your clothes: depending on the activity you should choose those materials and shapes which are the most comfortable possible, specially about terms of transpiration among other aspects. 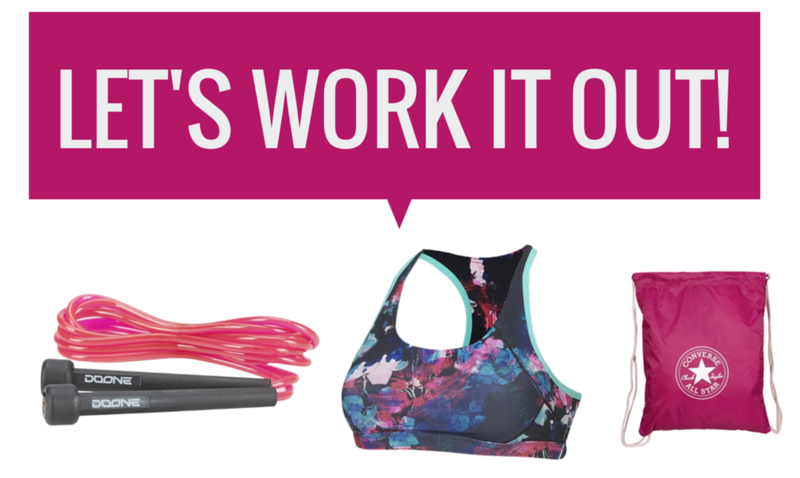 Here I'm giving you some ideas of #sportstyle you could use to work out and rock it! 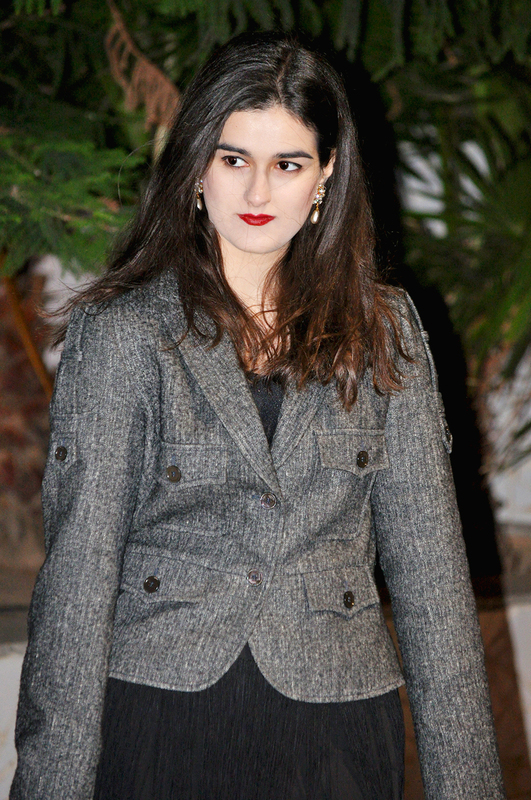 Some time ago, Coco Chanel said "Fashion is not something that exists in dresses only. Fashion is in the sky, in the street, fashion has to do with ideas, the way we live, what is happening." I truly believe on this statement, and since I write in this blog, many things have happened around me that I'm able to say that fashion is not only about what you wear, but also how you feel, and what kind of feelings you send to others. That's how I suddenly felt inspired to work on this "10 most iconic women perfumes" (sorry guys! As I do not have total knowledge of male scents, I couldn't work on that too) watercolor illustrations on a succession of last summer, boring days at home waiting for my friends to arrive to the city. So, there we go! Some of them are super recognized, known everywhere perfumes; other were launched a few time ago but have somehow found themselves their place on our vanities. I've tried personally some of them, some not. And you can also get your own watercolor prints if you like any of them at my Society6! Hope you enjoy this post as much as I enjoyed painting this illustrations. 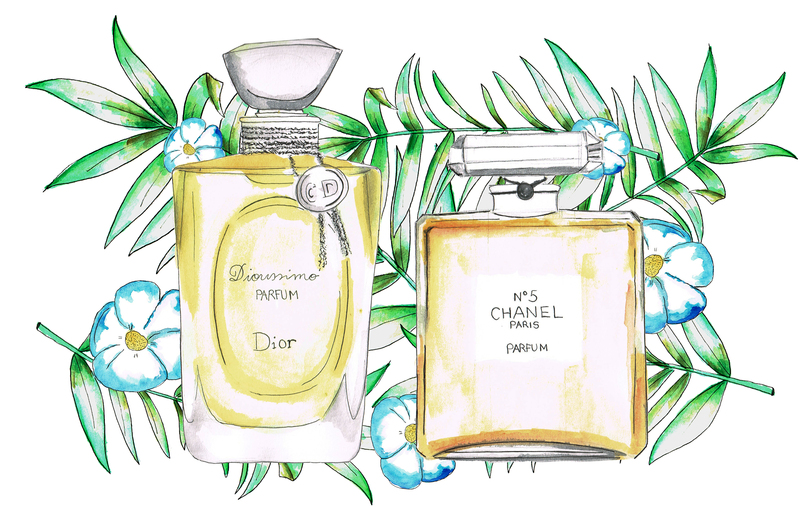 Did you know some of this scents? Have you tried any of them? Being conventional is not my thing at all. I like to be different, to stand out from the mass. And that means doing weird (but really fun) things sometimes. Back to July's last days I saw this super shiny, divine, golden metallic swimsuit at my regular, closest shopping centre near our summer house. It was on the sale rack, and there were plenty of different sizes because, let's be honest... Who is crazy enough to walk around the beach promenade on a golden metallic swimsuit? Well, I am. I think I had never posted before around here a picture wearing a swimsuit or similar clothing, with almost bare legs and showing so much skin, but today I'm confident enough with my body to show you, and now I know there's nothing wrong on spreading my self-confidence around. I've been reading too much body-shaming articles lately unfortunately, posts and interviews to really famous designers on how you should be ashamed on having a body-shape or another, on being taller or shorter. And it shouldn't be that way! 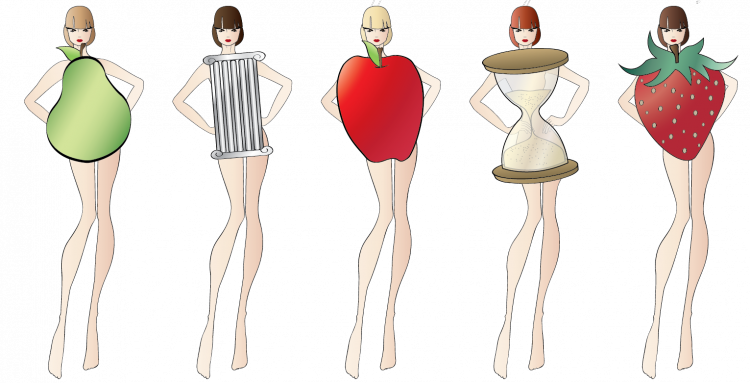 Everybody should be aware of their proportions and shape, know what are the most flattering pieces for them and spread the best about themselves, both physically and mentally, no matter their size, height or weight. Getting back to today's outfit, well, it's a shiny swimsuit. 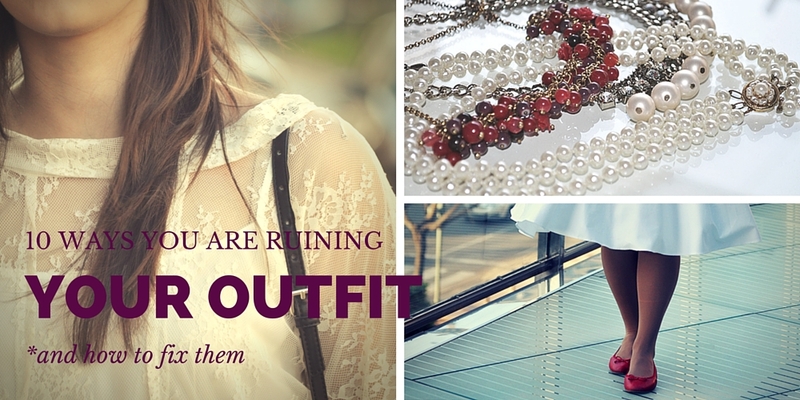 I had this fashion blogger moral/non-written obligation to show you such extravagance! You know, we have this TV commercial in Spain every Christmas about a sparkling white wine where there're a group of young ladies dressed on golden swimsuits and costumes dancing around as they were bubbles of such drink. It's really fun, because this new swimsuit is really similar to them's. About the accessories in the outfit, as I wasn't actually around the beach (we shot this at our place's terrace as it was getting darker and darker really quick! 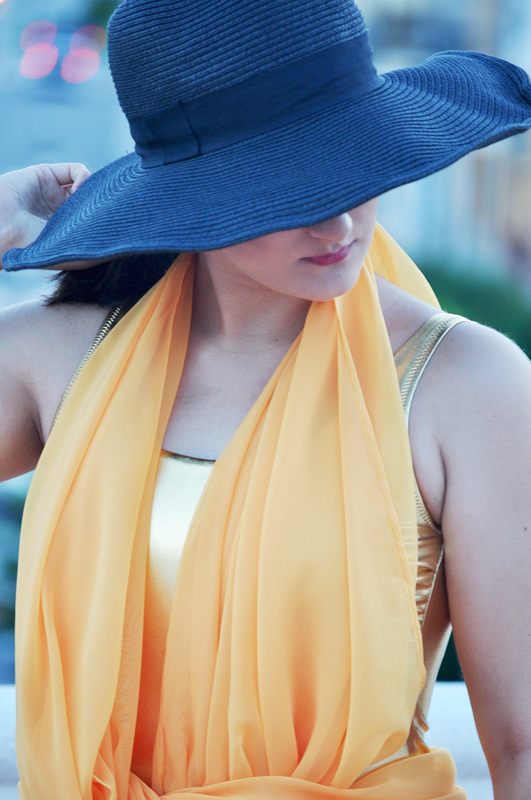 ), I wore this matching golden statement earrings I bought in Mérida, with this vintage hat I found around the house (I can't relate how many old clothes and stuff I have on those wardrobes) and this DIY yellow beach wrap which was as easy to make as taking a really large piece of sheer, silky fabric, and rolling and sewing around the edges to finish them. Matchy-matchy means keeping your whole outfit coordinated from head to toe. From crop-tops or tops matching your skirts or bottom clothing, to coordinating all your accessories, that is matchy-matchy trend. The trend comes from the 90's, and has been featured on several catwalks by Stella McCartney or Dolce & Gabbana among others. Matchy-matchy is not precisely what I would say a style that would go unnoticed: the more patterns, the more colorful, the better! You know I'm not a big fan of trends, but I like to wear whatever I feel the need to, trendy at that time or not. Neither I'm of crop-tops. 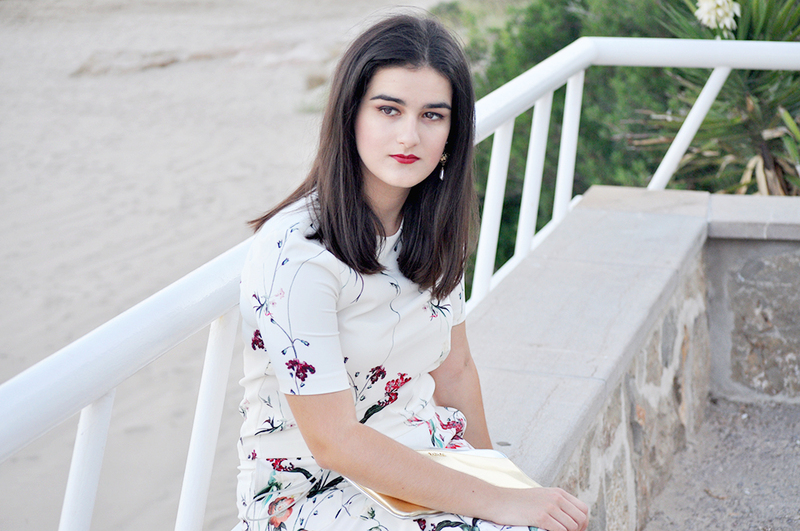 In fact, when I found this floral set at Zara, I first thought I would wear the crop top and skirt in separate ways, but I couldn't deny they looked too nice paired together once I assembled my suitcase for the beach town! I can't believe holidays are almost over guys, and that there's less than 3 days to come back to classes at that crazy place which is Architecture School. I would be lying to you if I said I'm not really in the mood of coming back, because somehow I spend so many hours there daily, that College feels almost like home. Also, a little bit of routine and group work with great music, food and jokes won't do any bad, isn't it? Despite that meaning maybe not being able to post as much as I've been doing lately, but you know you can always find me strolling through my Instagram and Twitter accounts. Did you know about the matchy-matchy trend, or have you ever worn it? 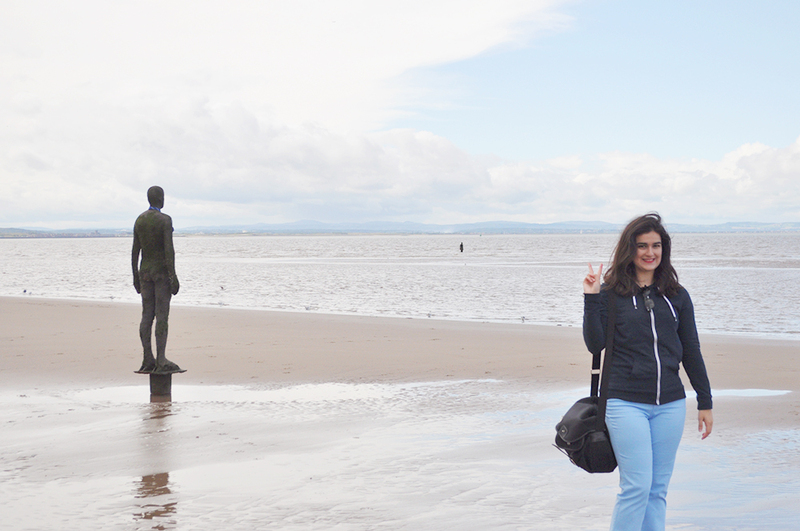 After the "What to do/visit in Liverpool" post, I almost forgot to show you this second part of our #Valencia2Manchester trip! 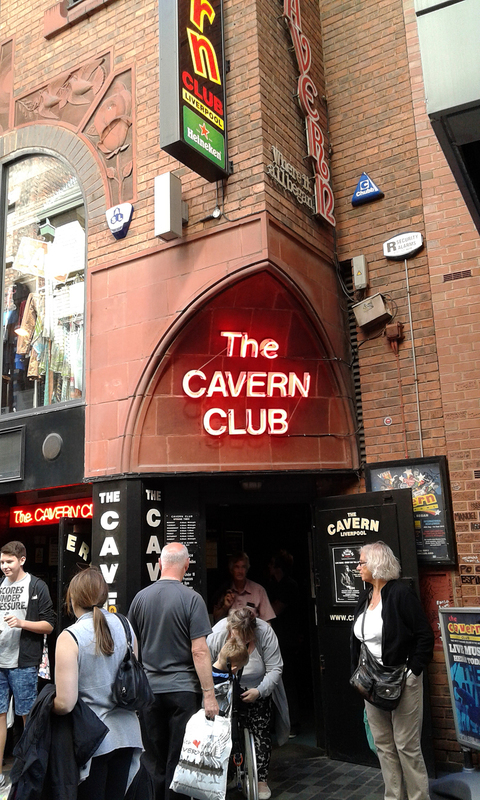 Getting to explore Liverpool was a really great idea because as I said on the previous Manchester post, it is certainly a really medium-to-small city although there're plenty places to go, and plenty plans to do! Our last days at the city were really off-duty. We were so tired we got to our hotel on really early evenings to take a nap a go to sleep early too! There weren't any places left to visit on our "Manchester must see" map, and the weather started being very unpleasant (it was really cold in the mornings, cloudy all day or it even rained in the evening. A very English weather! ), so we decided to take it easy and discover the city on the most relaxed and local way. 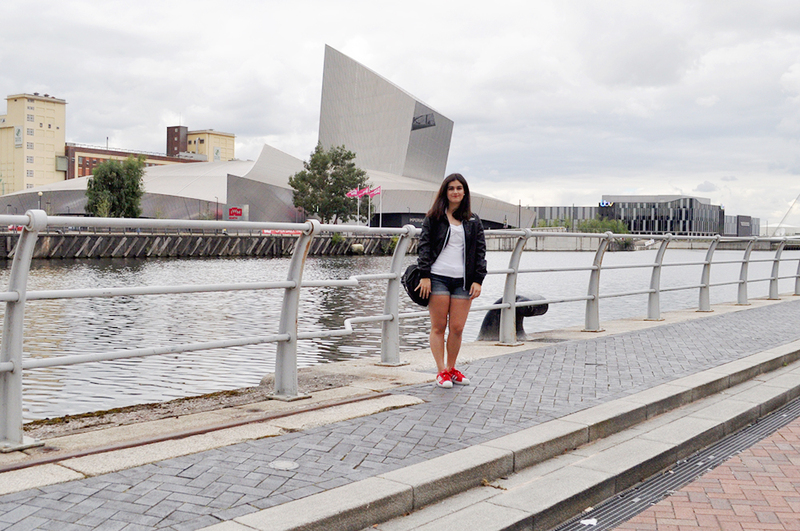 As I was also visiting an old friend, she recommended us to go to The Lowry Outlet at Salford Quays, just in front of Manchester Arena, the War Museum and MediaCity UK, where there are located some TV studios. It is really easy to get to Salford Quays by taking the X50 bus at Manchester Picadilly Gardens, and it is a really beautiful place with that lake, the museum and the Auditorium to do some sightseeing and take pictures. 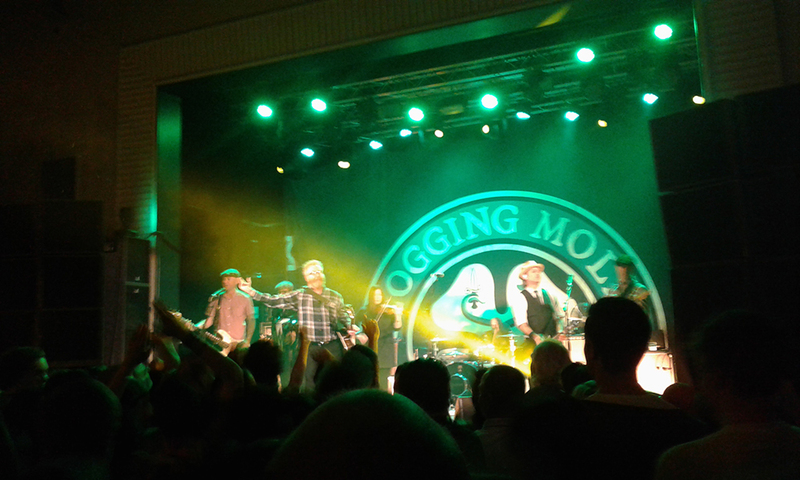 We also got some tickets for this joyful, Irish inspired music group which is Flogging Molly. That's why you may saw me with this green clover painted on my face in my Instagram account a few days ago. I had so much fun and I turned to be a nice fan of their music. We also went for some last-hour vintage shopping. It's incredible how many thrift stores and second-hand shops there're at Manchester Oldham Street and its surroundings. Obligatory stop at the city, either you're looking for vintage clothing, pre-owned books or music. We visited the Manchester Museum and the Withworrth Art Gallery as well, which are really close to the University area at Oxford Road and were I found a window of the "Fashion Revolution" movement which I've been following for a while. Although we had a really difficult comeback with our flight, which was plenty of turbulence and sudden descents, I had so much fun with my friends in Manchester, and I hope to return to the UK as soon as possible! How to design your own dress... Without sewing skills! Designing your own clothing may look like a really difficult thing when you have zero sewing skills. But it actually isn't. As you already might know, I'm a design enthusiast, and I do design a lot of things. I'm always drawing, creating, even doing my own prototypes of circle skirts, jewelry, etc. But one thing I'm unable to do is sewing. I'm a total dummy on sewing, and I will always fail sewing my own dresses and a bit more complicated than circle skirts designs. But I still wanted to create and wear my designs... And then light came: Why not hiring a seamstress who I could take the fabric I wanted to, explain my idea to her and who could give me some advise on how would be the best way on getting my new, unique piece to be made? At first I thought it would be one of the most difficult tasks to do in this world. A seamstress? It would be absolutely impossible to find one, and also a very expensive thing. But anything beyond it! At least in Valencia (and I presume, most medium-sized cities and towns on this world) there're plenty of both professional and amateur seamstresses who do not only sew dresses and blouses, but will also help you fixing an unexpected hole on your favorite jeans, will shorten your pants' or party dresses hems. Finding María José was pretty easy just doing some research on the Internet and asking friends and relatives, and her workshop is just a few bus stops near home. We brought to her a few fabrics (this red Toile de Jouy fabric is actually from this fabric haul I did a long, long time ago...) and just explained to her with words and a few drawings what we had in mind for our brand new, unique clothing designs. 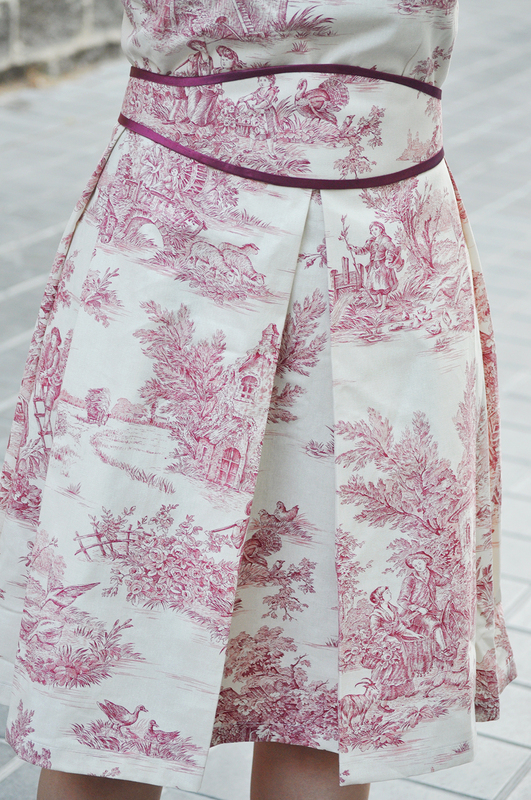 Apart from this super cute, vintage inspired A-line pleated Toile de Jouy dress, she also sewn a felted winter skirt which I hope I can show as soon as I start shooting winter outfits! 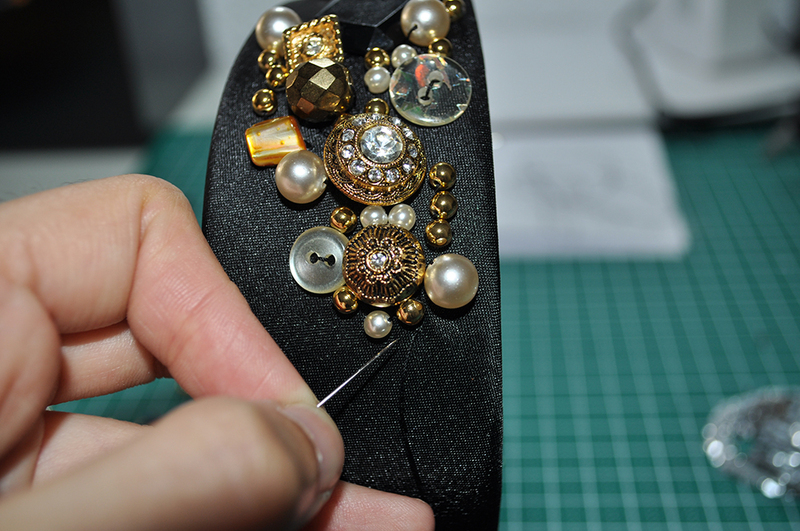 Have you ever brought something to a seamstress to be fixed? Do you also design clothing but do not sew them? Almost 5 years of fashion blogging, and I still manage to feel amazed everyday. I was a total rookie on fashion when I started this adventure, and as a lot of things in life, you start learning and accumulating experience little by little as events go by. On this 5 years of posting my own outfits and some previous years of watching others mixing and matching their clothes, I've learned (or secured the ones which were already there) some concepts and fashion tips I know I'll use and make the most of them the rest of my life. Some of them are my own experience, others have been discovered by intuition or seeing others' outfits. 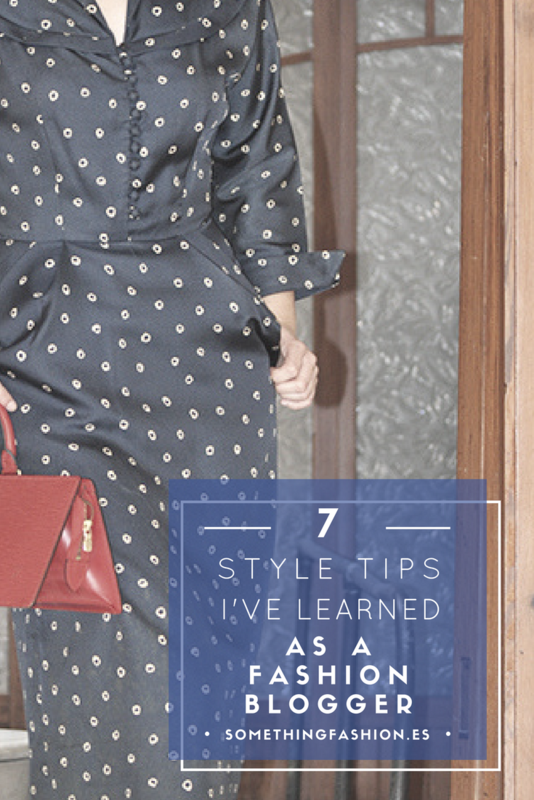 Want to know what are the 7 style tips I've learned as a fashion blogger? I was really sceptic about this trend of mixing navy or dark blue with black, but after watching the Yves Saint Laurent biopic and discovering he was a pioneer mixing this hues, I started believing it couldn't be that bad. Actually I haven't tried it on public, but now wearing a black suit with a navy blue accessory or blouse doesn't sound like a bad idea at all. Those of you who follow Something Fashion at its main social platforms (Facebook and Instagram, mainly) might now that I spent last week strolling through England. About 5 years ago I discovered this country thanks to an immersion English course on the south & London, and it was time to commemorate it, do some tourism and visit old friends who are currently living at the city. So, my friends and I started looking for accommodation and flights in early March, and things to do and visit as well on a 7-day trip. Unlike the other summer trips I've been doing to the Netherlands past year, or Ticino we were 100% on our own, so the timetable and plans were more improvised and budget-friendly than ever. And still, we managed to have the best time ever. Traveling with friends should always be like that! We were established in Manchester, near downtown, and we were planning to do Liverpool & Manchester as our main visits as we noticed they weren't huge cities at all. I was really afraid we got lost as we were on our own, although we carried maps and had our Wi-Fi smartphones ready just in case something happened, but I must say, since the very beginning of our trip, anything we wanted to do, anywhere we wanted to go was signposted very nicely and clear. From landing on the airport, to taking the train to Manchester Picadilly Station, to arriving our hotel. Even the weather was on a truce, since it only rained cats and dogs our last night and departure day. So, what else can I say? Manchester was nothing I expected. It has a really chaotic and messy urban planning (the little Architect inside my head has always something nerdy to say), full of hidden corners with pubs and restaurants to discover, full of really new, futuristic and super high buildings mixed with ancient and traditional red brick constructions. As I said before, it is not really a huge city so walking everywhere or taking the three Metroshuttle lines (free all downtown!) may be enough to enjoy Manchester as a local would do. 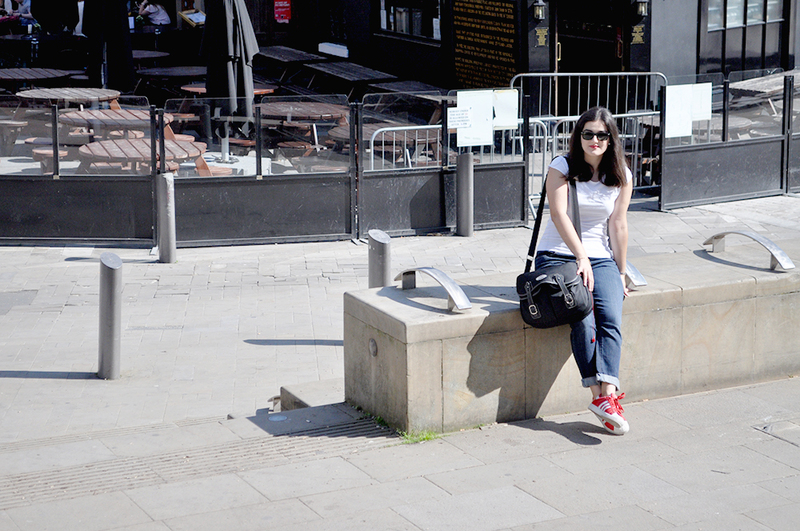 What to wear to stroll around Manchester, you'd ask? As we were focused on sightseeing and discovering the city whatever it took, I only carried with me this vintage Adidas' sneakers, and as the weather was totally uncertain (it wasn't really hot, but I'd recommend wearing a jacket or something warmer on early morning and evening) I packed a mix of shorts, thin but long jeans, a pair of sweatshirts and my waterproof jacket and a bunch of basic T-shirts. For a 7 day trip with uncertain, crazy English weather it was enough. Have you ever visited Manchester or Western England? What did you visit? Pure. A start of something or good things. Cleanliness. White is usually associated with this adjectives, and once I realized I have tons of Pinterest boards plenty of white colored things, and once I saw I did inspiration posts before focusing on topics I also care about or like, but not having the same meaning as the color white for me, I thought it was the right time to do so. White is my main color, that being said. 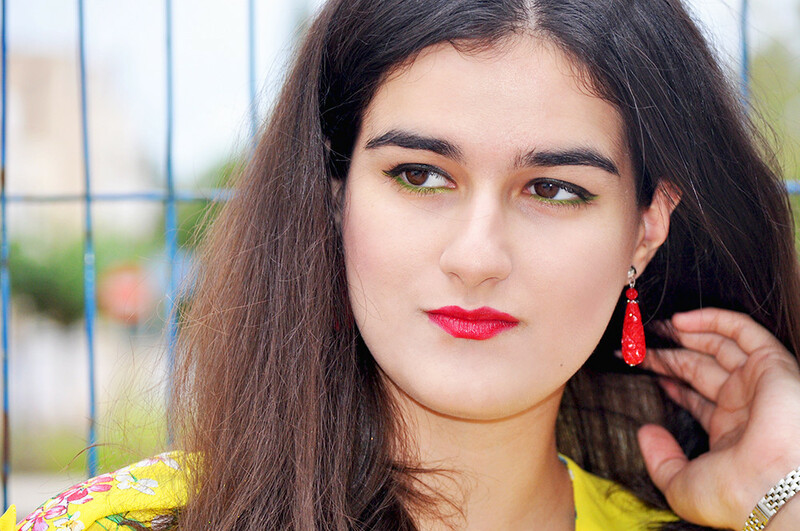 For a long time when I was a child, I used to wear red a lot: it looks great on dark-haired and tanned skin girls like me. But once I grew up, I realized I started pairing everything with white, using it as the lead color when thinking about my outfits. Whenever I go out for a big party, I wear white because it is the most visible color when you're on a disco in the dark. It is also one of the most used hues on the typical Spanish architecture on the south and coast. And the color I mostly make my buildings and projects' façades of. White for me means primariness, light and space. So now that I'm getting ready for my next trip to Manchester, where I'll be leaving tomorrow for a week, and now that I needed a boost of ideas for my packing (have you seen my tips for packing your luggage successfully?) maybe a bunch of white images for inspiration would make my day! What about you? What's your favorite color? Does it have a meaning for you? I'm not really used to mix different prints nor not pairing something with black or white accessories. Seriously, I have a real problem matching different colors and creating a outfit which doesn't look like I'm a clown. I'm not really much into colorblock trend, I must say. So, when I don't feel in the mood of taking black or white as connectors so all the outfit makes sense, I just change them for another color. 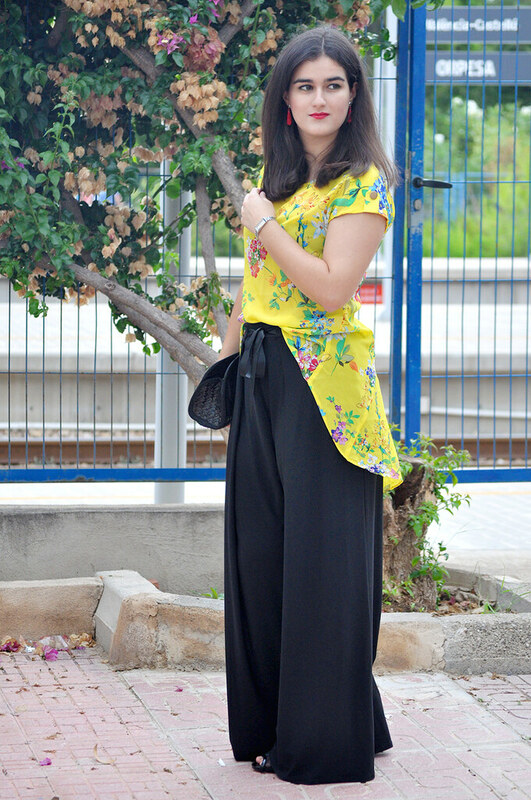 I chose to pair everything with this yellow bag and sandals coord I discovered a while and which I wear a lot. I had this colorful halter dress for years, but as I keep it at the beach town house, I don't really wear it as much as I would like to. As it is really warm during the day, I wore it last afternoon to go out to the Town Hall square to have some iced coffee. I find fascinating how different is living on a town like this and a medium-sized city like Valencia, and how life here is all about the town square and hanging around there. What do you think about this new direction at Something Fashion? If there's something I've been obsessed for a long time now, it's been Dolce & Gabbana designs. Since I started following their fashion shows and catwalk steps about 3 or 4 years ago, I've fallen in love with too many of their items to keep the count of them. Still, my budget is limited and a regular college student can't obviously afford one of their designs. 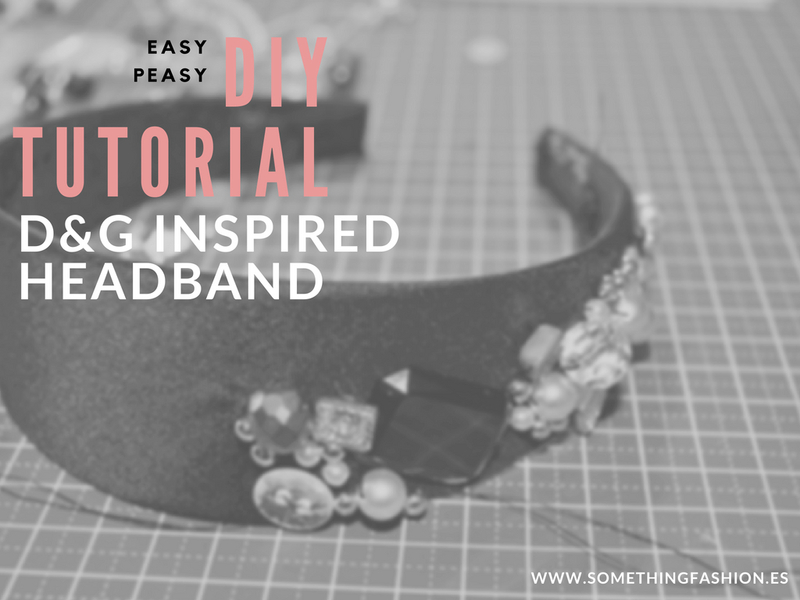 As I've been really inspired and really in the mood these last days on crafting and creating new DIY projects, and although tutorials on how to make it like a pro can be found all over the Internet, I've decided on showing you guys how to master the Dolce & Gabbana inspired jeweled headband from their FW 2012-2013 fashion show inspired in baroque and Italian nobility. It's better if you stick to a 2 to 3 color schemes on making your headband. I chose for mine only black, golden and transparent beads and buttons. Otherwise, if you find any other bead or embellishment but not in your preferential color, buy a spray and color it! 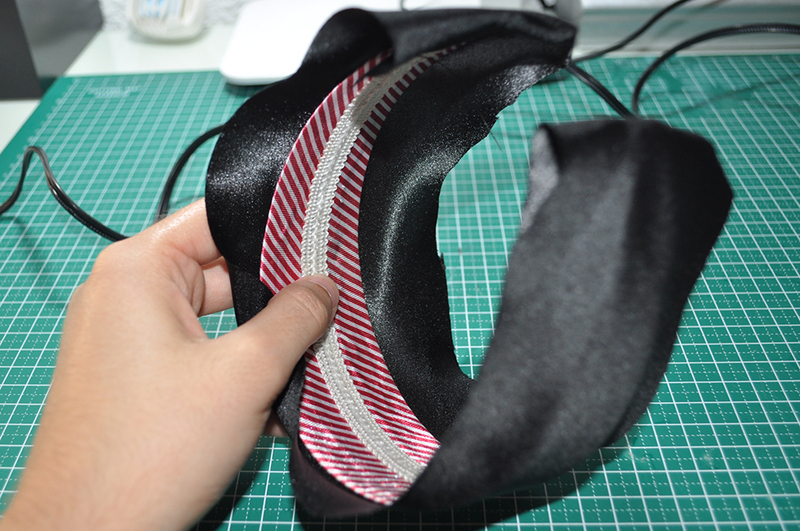 Place your wide, non-black-fabric headband on the black velvet or the black fabric and use it as a guide for bias cutting a piece of fabric. 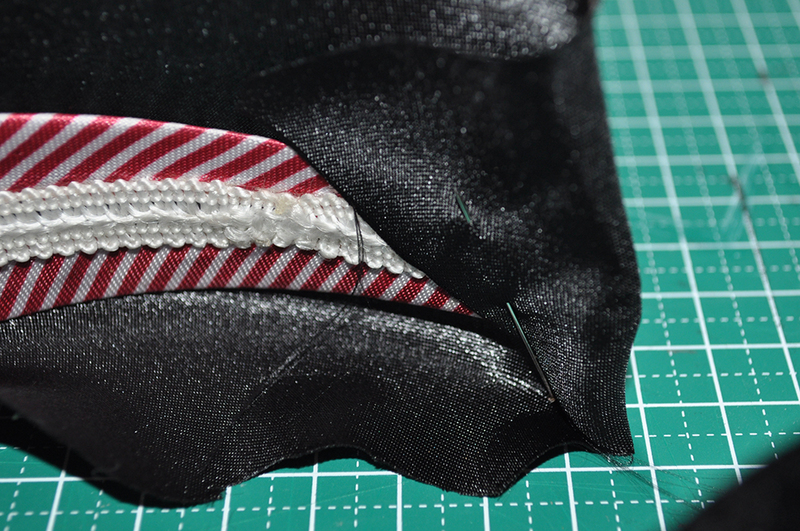 Place the headband as if you would like to roll it on the fabric, and cut along the imaginary line the headband makes, leaving 3 to 5 extra cm along the width and the length of the headband. 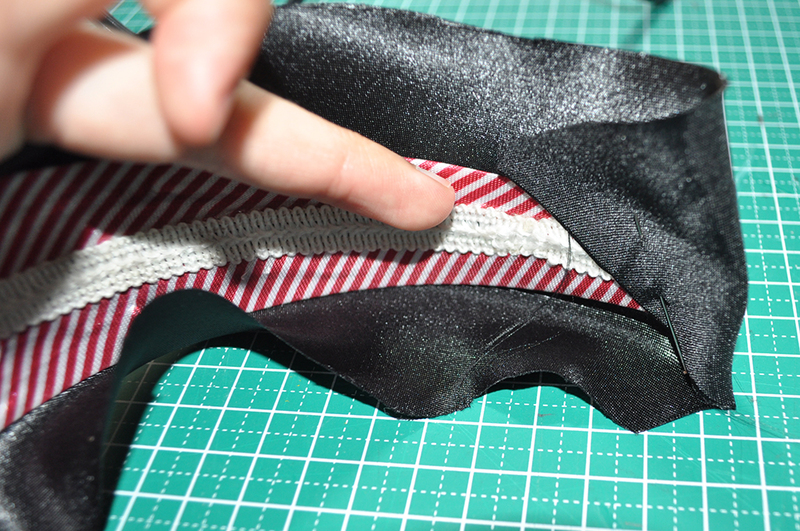 This will help you glue the fabric to the headband! 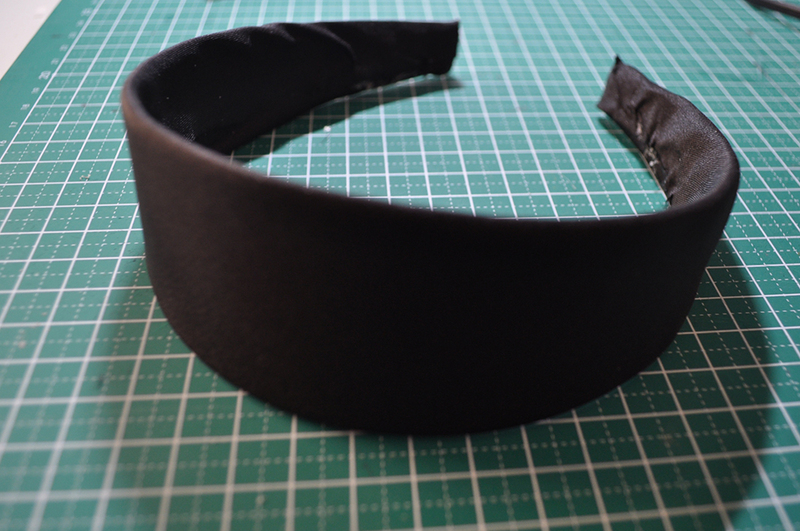 Put two pins on the ends of the headband, and carefully glue the black fabric to it being careful with the ends so they look neat and clean. 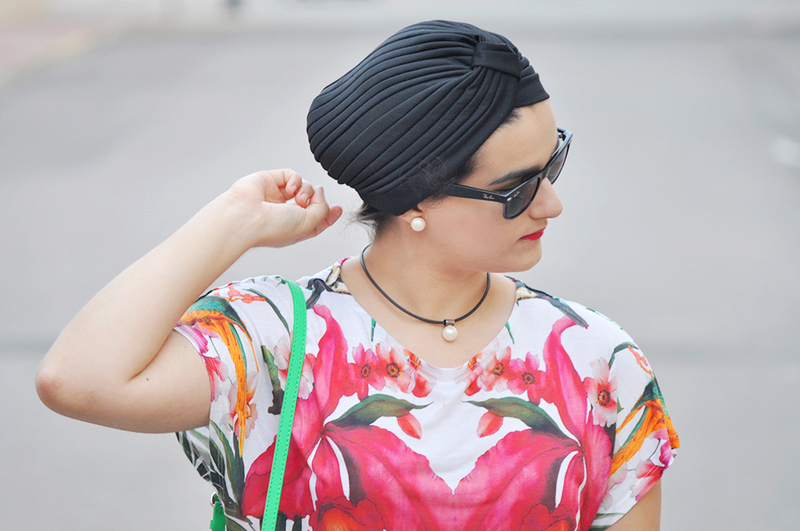 Once you arrive at both ends, carefully leave a pin at a time, and finish covering your headband. 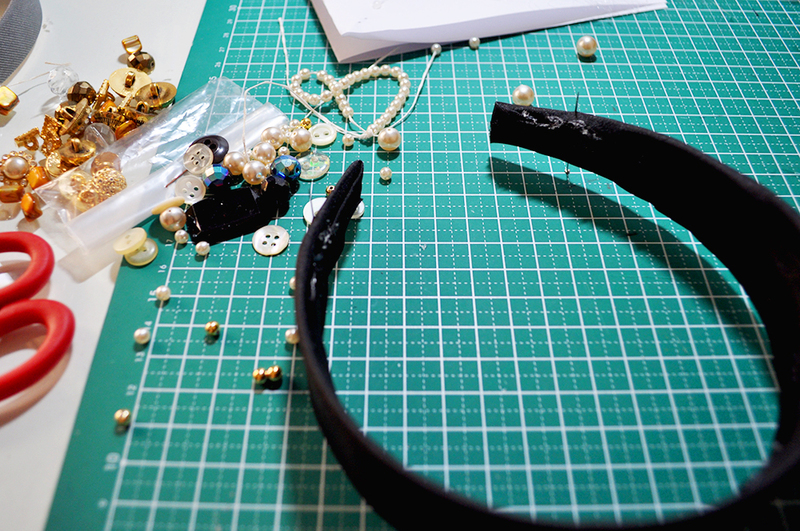 Now that your headband is covered and we have a nice and neat background to work at, let's start gluing the pearls, stones, and jewelry. First, try on your headband and carefully place two pins when your ears are. One pin each side. That will mark where you're going to start putting jewelry. In my case, I must say I finally ended sewing them. It takes a bit more of time, but it assured me a much better result than glue (looks like my fabric repealed the glue, and all the jewelry ended falling off) and the security on the beads was indisputably better. 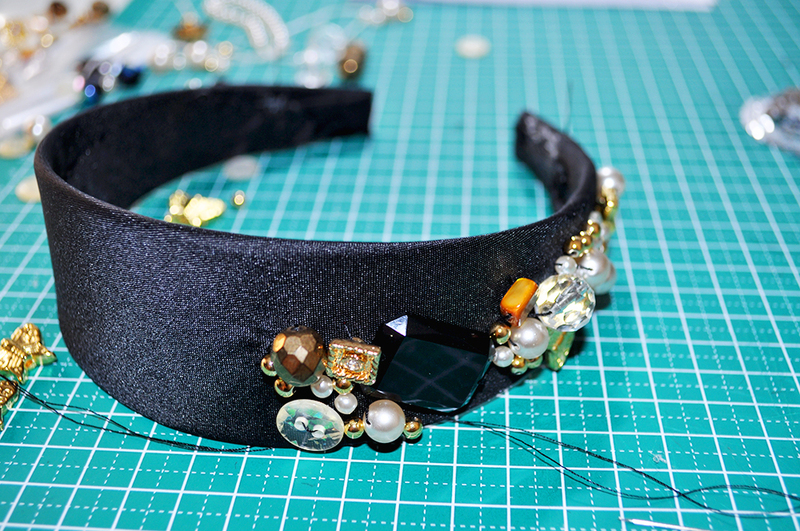 If your fabric covering the headband is a satin, or a slippery kind of fabric, I would go for sewing the beads. 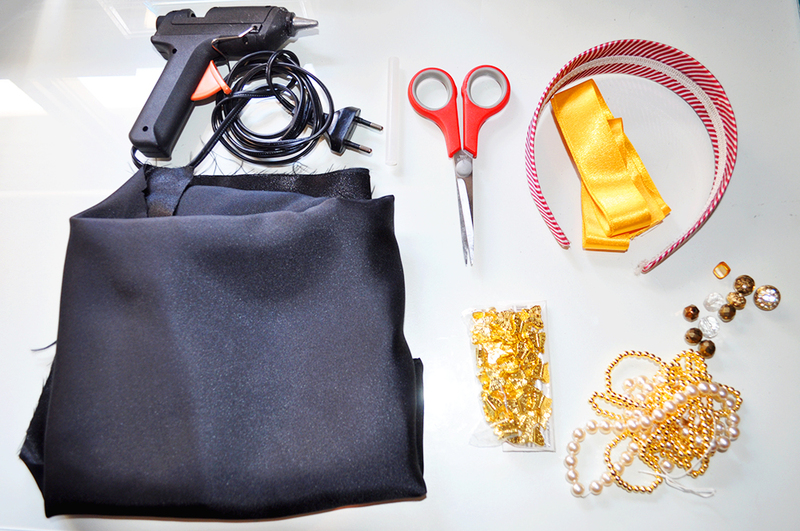 Otherwise, if your fabric is a kind of velvet or cotton fabric, then go for glue. I thought a piece of ribbon on each side of the headband would look great. However, I finally didn't put it. In case you'd like to add it to the sides of your headband, so you can tie it at the back of your neck, just sew (or glue) two pieces of ribbon about 30cm each at each side of your headband. 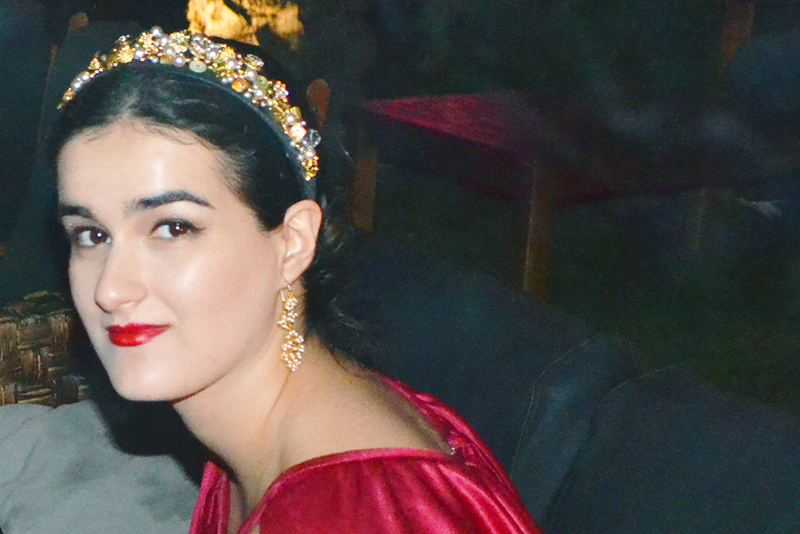 And you're done with your jeweled headband inspired on Dolce & Gabbana 2012-2013! Did you try this DIY tutorial? Will you share your design?